Meeting deadlines is one of those basics that I learned years ago as a journalism student in high school and then college. What I didn't know back then is writers are notoriously late on their deadlines (magazine or book deadlines). If you consistently hit your deadlines with quality writing (key), then you will stand out from other writers. When I became an acquisitions editor years ago, I sat in hours of scheduling meetings where we went through all of our books to see if they were on schedule or not and made adjustments to the schedule. Authors have no idea about these meetings and the trauma you cause to your own book when you miss a contract deadline. Your book may not get sent out to reviewers or the press release may get skipped or the catalog copy on your book may be wrong or any number of other things. Yes you got sick or your child or grandchild got sick and you needed two more weeks or a month extra. You will not see the results of your moved deadline for several years when your book doesn't find your audience or has poor sales. That is the truth of publishing. 1. 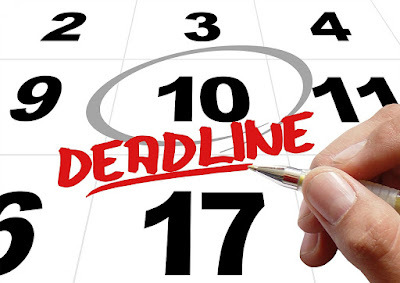 Understand the importance of hitting the deadlines large and small. You will be positioned as a different writer if you hit or exceed your deadlines--since most of your colleagues miss them or slide them. In this crowded market where there are many submissions, you want to stand out as a writer. One of the easy ways to stand out is to meet your deadlines. 2. Use reminder tools. Most of us have a smart phone and there is an app called reminders. I use it all the time to set up a reminder about a deadline I need to hit. That deadline may be writing or a call I need to make or something personal. It flashes on my phone on that time and date. 3. When the inspiration strikes, work ahead. I have been blogging at least once a week for years--but I've learned to crank out the draft of the blog in a few minutes. I've also learned to schedule blog posts--something I didn't know or use at first. Learn to use these different features and it will help you. 4. Create your own system for meeting deadlines and creating great content. Everyone wonders how I tweet so much with great content. I've developed a system (follow this link to learn details about my system). You will have to find your own system but I use tools like Hootsuite to post content on a schedule (free). I also have created a plan for each day and a template that I fill in with different tweets. For example, every day I begin with an inspirational quote and if I have room, I include a photo (to get attention). I find these quotes all the time and put them into future tweets. It only takes seconds but helps me. Hit your deadlines for magazines or books or blogs or whatever. It's important and will distinguish you in the writing community.